25g Protein + Super Fruits and Vegetables per serving. protein for sustained energy. Feel the difference of Macro Nutrition! WHAT ARE THE BENEFITS OF USING MacroMeal? Vegan Protein is a maximized blend of *time-released plant based proteins (Pea Isolate/Fast Release, Brown Rice/Medium Release and Pea Protein Concentrates/Slow Release), contain essential nutrients that support optimal health. Protein plays a key role in increasing strength and lean muscle mass. MacroMeal “OMNI” Protein is a maximized blend of *time-released proteins (Collagen Peptides/Fast Release, Whey Protein Concentrate/Medium Release, Brown Rice and Pea Protein Concentrates/Slow Release), contain essential nutrients that support optimal health. Protein plays a key role in increasing strength and lean muscle mass. “OMNI” Protein = protein for conscience omnivores. Coconut Oil Powder naturally contains MCT (Medium Chain Triglycerides) that sustains energy and satisfies hunger. Antioxidants Antioxidants boost overall health, immune system and provide anti-aging benefits that maintains beautiful skin. Probiotics are friendly bacteria that play an important role in digestion, restore healthy intestinal balance. Plant Based Multivitamins & Minerals support the maintenance of good health with the nutrients your body needs. Trace Mineral Complex aids recovery and hydration for active lifestyles. Fiber nutrient dense fiber blend helps regulate hunger and blood sugar. Digestive Enzymes promote optimal digestion for better absorption and greater bioavailability. (Omni and Vegan) are scientifically formulated with an advanced blend of fast, medium and slow digesting proteins that deliver protein for sustained energy. Plus all the goodness of Macro Greens and Miracle Reds. Feel the difference of Macro Nutrition! is a maximized blend of time released plant based proteins (Pea Isolate, Brown Rice and Pea Protein Concentrates), which contain essential nutrients that support optimal health. Protein plays a key role in increasing strength and lean muscle mass. is a maximized blend of time-released proteins (Collagen Peptides, Whey Protein Concentrate, Brown Rice and Pea Protein Concentrates), which contain essential nutrients that support your optimal health. Protein plays a key role in increasing strength and lean muscle mass. naturally contains MCT (Medium Chain Triglycerides) that sustains energy and satisfies hunger. found in fruits and vegetables are your best defense against the damaging effects of free radicals on healthy cells. Antioxidants boost overall health, brain health, the immune system and provide anti-aging benefits that maintains beautiful skin. are friendly bacteria that play an important role in digestion, restore healthy intestinal balance, and boost overall health. support the maintenance of good health with the nutrients your body needs. aids recovery and hydration for active lifestyles. Is this considered a meal replacement type of smoothie? “Technically”, not a meal replacement because it lacks the required amount of carbohydrates to officially be deemed a meal replacement. However each serving provides 25 grams of protein, plus 3 servings of fruits and vegetables. Does the MacroMeal have a full serving of the Macro Greens in it? There is 1/3rd of a serving of Macro Greens and Miracle Reds in each serving of Macro Meal. 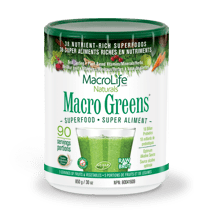 If you want to boost the antioxidants, phytonutrients, enhance the probiotics and more of the great ingredients we suggest you add one scoop of either Macro Greens or Miracle Reds. Either way, you are still getting the benefit and much more. The serving size is 2 scoops = (45g). Each scoop is approximately 22.5g. Is this considered conducive to weight loss or just more overall immune/gut/nutritional health? MacroMeal is a dietary supplement and not intended to be used as a meal replacement. However to use it as more of an overall immune/gut/nutritional health, just add one serving a day without replacing a meal. I’ve never quite been able to do a meal replacement smoothie. I always seem to get hungry soon after. The MacroMeal will keep you full. The MCT oils will fill you up and satisfy hunger along with the 25 grams of protein. We have fast, medium and slow digesting proteins to satisfy longer. What are the Amino Acids in Macro Greens?